You can view the services and drivers installed when the package was created or add new services and drivers by choosing the Services & Drivers tab in the project dashboard. Driver and services are shared components within the operating system, which means that while the files and registry keys can be virtual, the running process affect the entire operating system. Certain types of services or drivers must be ran at system startup and these, as well as any dependencies, may need to be made to Installed-temporary (layer 2). When you remove a service or driver, you may have to use a configurable AppEvent trigger to perform a system reboot. In the Services & Drivers tab, open the context (right-click) menu in the pane, and choose Import Service or Driver. In the Import Service or Driver dialog box, select a service or driver from the list and choose OK. Choose Yes to add the image for the service or driver to your package. In the Services & Drivers tab, open the context (right-click) menu of the service or driver for which you want to change the disposition, and choose Service Key Disposition. In the Service Key Disposition dialog box, select the disposition for the registry key, and choose OK. If the message box appears, choose Yes to change the ancestor keys to Virtual-integrated (layer 3). If the you added the image file for service or driver through the Files tab, you can edit the prefetch, disposition, and security settings from within the Services tab, rather than having to locate and edit the file from the Files tab. Any service or driver in a package with Virtual-integrated (layer 3) disposition are guaranteed to have all of their dependencies (e.g. .dll, .ini, .manifest, .cfg, etc. files) available to the service or driver. If you set the service or driver to Installed-permanent (layer 1) or Installed-temporary (layer 2), set the dependencies to the Installed-permanent (layer 1) or Installed-temporary (layer 2) disposition. This is important if the services are meant to automatically start at Windows logon. You can use Dependency Walker as a tool to identify DLL files that an executable needs to run successfully. In the Services & Drivers tab, open the context (right-click) menu for the service or driver for which you want to change the image file properties and choose Edit Image File Properties. In the Image File Properties dialog box, select your settings, and choose OK. In the Services & Drivers tab, open the context (right-click) menu for the service or driver for which you want to change the image file properties, and choose Edit. In the dialog box, change the settings and choose OK. In the Services & Drivers tab, open the context (right-click) menu for the service or driver for which you want to change the failure action, and choose Turn Failure Actions OFF if restart is enabled or Turn Failure Actions ON if restart is already disabled. The option is grayed out if the failure action cannot be changed for the selected service or driver. 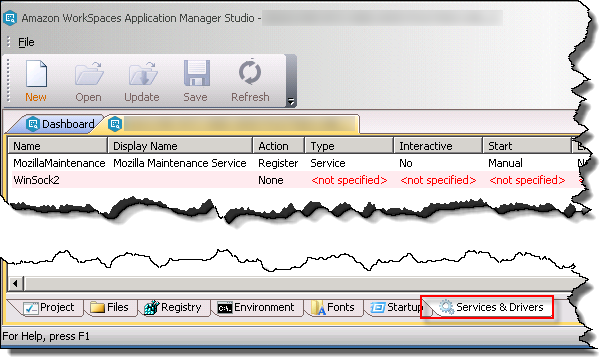 If the failure actions are enabled for a service or driver, the name of that service is red. In the Services & Drivers tab, open the context (right-click) menu for the service or driver that you want to delete, choose Delete, and choose OK.
Services or drivers that are excluded are not used in operating system, but are still part of the package. This gives you the flexibility of including specific services or drivers in one package deployment and not in another package. Excluding services or drivers also enables you to test an package without a service or driver before removing the service or driver from the package. In the Services & Drivers tab, open the context (right-click) menu for the service or driver that you want to exclude, and then choose Exclude. Excluded services or drivers appear in italicized text.